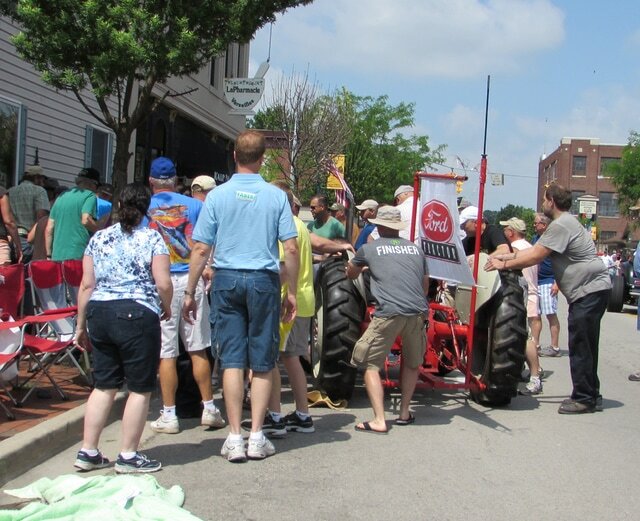 VERSAILLES — Laughter and cheers quickly turned to screaming and tears at the Versailles Poultry Days Grand Parade Saturday morning when an antique Ford tractor suddenly lurched out of control and plunged into the crowd lining the streets. Two children and two adults were seriously injured and were airlifted by CareFlight. The children were taken to Dayton Children’s Hospital, where they were treated and released. Their grandparents, Thomas and Kathy Hamilton, were taken to Miami Valley Hospital. Thomas, 64, was listed in fair condition and Kathy, 63, was listed in critical condition as of Sunday afternoon, according to a hospital representative. The driver of the tractor was not injured, and he was able to drive away on the tractor to clear the scene for emergency vehicles in the immediate aftermath of the crash that took place in front of Fast Insurance Agency and Kaup Pharmacy on Main Street. Police identified the driver as 82-year-old Elbert Wilhelm, of Piqua, who reportedly was a parade regular, having participated for at least 20 years. “He just told me that it got away from him, it accelerated and he tried to back it off and when he did he just couldn’t back it off fast enough. And he swerved and missed the parade vehicle in front of him when he did that, that’s when he lost control and went up into the crowd,” village patrol officer Frank Maus told WDTN News. The parade was rerouted up Center Street and resumed while rescue efforts were ongoing. The crash remains under investigation.